LONDON--(BUSINESS WIRE)--Technavio analysts forecast the global portable printer market to grow at a CAGR of close to 18% during the forecast period, according to their latest market research report. The introduction of advanced security solutions in portable printers is one of the major trends being witnessed in the global portable printer market 2019-2023. The unprotected printers are the easy target points for hackers and cybersecurity issues. Cybersecurity issues can range from hackers retrieving saved documents from a printer's memory, targeting printers to launching denial-of-service (DoS) and installing malware for remote printer control. Therefore, companies are increasingly focusing on establishing robust security measures for ensuring the integrity of their printer systems. For instance, in October 2018, HP announced the release of security solutions called HP FutureSmart firmware and Immersive Analytics Service for HP enterprise-class printers and MFPs. Over the past few years, there has been increasing need to manufacture portable printers that are compatible with smart devices and applications, thanks to the growing demand for combining mobility and document solutions. With enterprises increasingly enabling employees to work remotely, the adoption of laptops and smartphones is exploding and hence, increasing the demand for advanced portable printers. Consequently, vendors in the market are offering printers that are portable and lightweight and are perfect for employees who need to work outdoors, which, in turn, will drive market growth. The global portable printer market research report provides market segmentation by application (transportation and logistics, retail, manufacturing, and healthcare), by technology (thermal, inkjet, and impact) and by region (the Americas, EMEA, and APAC). It provides an in-depth analysis of the prominent factors influencing the market, including drivers, opportunities, trends, and industry-specific challenges. The APAC region held the largest share of the market in 2018, accounting for more than 37% share, followed by the Americas and EMEA, respectively. Although the EMEA region held the smallest share of the market in 2018, it is expected to register the highest incremental growth during the forecast period. 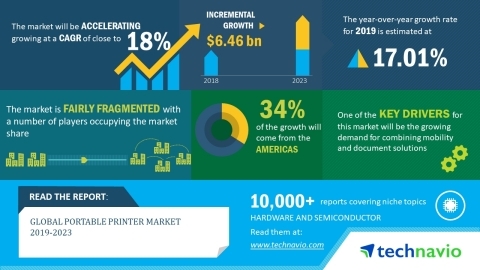 Technavio analysts forecast the global portable printer market to grow at a CAGR of close to 18% during the forecast period, 2019-2023.